Notts County are looking forward to the visit of Hereford United on Tuesday. Should they defeat the Bulls it will be County's third home win in a row. Yesterday they defeated Chesterfield 1-0. Two weeks ago they beat visitors Dagenham 1-0. However in their eight League games they have only scored eight goals. "It was a battle, especially in the second period, and towards the end we had to dig deep," said assistant manager John Gannon. "It was certainly the best game we've had this season, but Chesterfield played their part too in it. It was a good match and I hope both of us are up there come the end of the season. "This is just the start, because we know we've got another really big and tough game coming up this week against Hereford. "We're looking at these games (Chesterfield and Hereford) as one, and if we can get another win on Tuesday we will be really progressing in the right direction. But, we know it is going to be really tough against Hereford. They have had a good start. "There's still a lot of work to do on the training ground but if we get another three points against Hereford, which won't be easy, we will be heading in the right direction." One player Hereford United will know all about is Neil MacKenzie who joined the Magpies pre-season. He spent a spell on loan at Edgar Street last season and is a capable midfielder. The referee for the game is Clive Penton from Sussex. He has been in charge of six games this season mainly in Division One and has dispensed 16 yellow cards, but no red cards, so far. The Bulls will be looking to bounce back from the disappointing defeat at Grimsby when they visit Meadow Lane Nottingham on Tuesday evening for the League 2 match against The Pies. The ground was completely rebuilt in the early 1990's and is now one of the better stadiums at this level offering around 20000 capacity as an all seater. The visitor's accommodation is provided in the 5400 seat Kop End which has good catering facilities and offers an excellent view of the game. For those travelling by road, the trip is fairly straightforward so long as you enter Nottingham from the south (For Sat/Nav users, the postcode is NG2 3HJ). From Hereford go to Worcester and join the M5 north to Junction 4A where you join the M42. Follow the M42 to the end and onto the A42. As you approach the M1, branch left and merge onto the A453 (sign East Mid Airport/Notts South/ Derby). At both roundabouts, take the third exit onto the A453 (sign Nottingham). Continue to Clifton roundabout and take the 2nd exit (sign Notts) then keep in the left lane and branch left to a roundabout where you take the 1st exit onto the B679 (sign Grantham, Melton, Newark) entering Nottingham. At West Bridgeford, turn left into Loughborough Road A60 (sign Notts). Follow City Centre signs onto London Road and at the traffic signals turn right onto Cattle Market Road A6011 (sign Southwell, Colwick). Turn right into Meadow Lane.There is parking in the Cattle Market £2 or in the football clubs car park opposite their offices in Meadow Lane £2.50. Otherwise, there may be some Street parking. Distance about 110 miles allow just over 2 hours. Tony James is close to fitness after six weeks lay-off. The former Hereford United captain, now with Burton, played 75 minutes in a reserve match against Weymouth last Wednesday. James, now 31, suffered knee ligament damage just one minute into the opening game of the Conference season against Histon. "Tony probably needs one more reserve game, and we'll try to fix that up for next week," said manager Nigel Clough. "The fact that Tony is a senior player and was one of our major summer signings doesn't count for anything. Like any other player in the squad, he has got to work his way back and earn his place in the team on merit." Just 139 Hereford United supporters attended yesterday's match at Grimsby one of the lowest levels of support for the Bulls for a 3pm Saturday kick-off for many seasons. Last year when the game was played on a Sunday with a 4pm start and also televised by Sky about 130 loyal fans made the long trip to Blundell Park. The attendance for the game was given as 3699 whereas last year it was 4147. That's a drop of 448. A low attendance by Hereford supporters at Grimsby was in prospect as the Bulls have two away games in four days, the next at Notts County on Tuesday evening. No doubt given a choice many will have decided that the Notts County game is the more attractive of the two being that much closer and against, in theory, a biggest club. Last year the game was played on the Friday before Xmas, not the best date in the diary, and 278 fans braved what was a cold and foggy evening to watch a Hereford win with a goal from Tim Sills. Whether a higher number will watch on Tuesday remains to be seen. Meanwhile the cost of travelling to, admittance to, and refreshments at games are all rising. Yesterday an adult ticket was £18 and fuel was seldom less than 98p per litre anywhere on route. With a 2p increase in fuel duty this coming week, the cost of taking a car to Grimsby from Hereford will rise by around £1. The stadium was easy to find and there was street parking close-by. However it wasn't made clear beforehand that concessions tickets had to be purchased from the ticket office until at the turnstiles. Inside Hereford supporters had a good view from behind the one goal and with the sun strongly shining at the start of the game it felt like summer had returned. Until Grimsby scored when as though timed to rub salt into the wound, the sun disappeared and the wind started to increase. It felt 10C colder in a few minutes. To Grimsby's credit, the match programme was excellent. A 72 page £2.50 glossy production with lots to read. Maybe the best in League Two. And the refreshments in the stadium and close-by were also said to be very reasonable. The Hereford United coach, John Trewick, spoke to BBC Hereford and Worcester and other media after yesterday's game at Grimsby. "Too many individual errors. Too many individuals below the level they've been this season. It ended up being one of those days where it was always going to be hard work and we were punished. "The performance in the first half allowed them to pass the ball too easily and they were controlling the game. "Another day you don't get punished but we were punished today. "The second goal killed us. A very poor goal from our point of view." When John Sillett returned to Edgar Street as manager in the summer of 1991 he brought with him a pair of internationals. Rumour always had it that Snoz brought the pair in to justify his Bermudan beach break, but few current internationals had ever worn the black and white - let alone two at the same time. Meshach Wade and Kentoine 'Jed' Jennings arrived as the high profile signings that never lived up to the 'international' expectations. Both were used much as utility players, equally indifferent in full back or midfield roles. The pair made infrequent appearances across their two years at the club, totting up only 35 between them - mostly while Snoz was still in charge. But, still to this day, the pair are top stars in the Bermudan Island Soccer League. Both were named in the annual end of season all-star game in July - on different sides - in full back positions and Jennings is still is a regular squad member for the international side, 17 years after his debut, while still a regular feature for his North Village side. He is, however, on footballing probation until the end of the year following a six match ban for foul language to a match official. Wade is Head Coach at Southampton Rangers, narrowly missing out on promotion to the top flight of Bermudan football in his first foray in management, but saw his last outing for the international side in early 2006. Stuart Fleetwood, pictured, was the pick of the ex-Bulls this afternoon with a hat-trick for Forest Green Rovers in their 3-1 win over Cambridge United. Tamika Mkandawire scored from 25 yards to help his new team Leyton Orient defeat Bristol Rovers 3-2. Andy Williams was a sub for Rovers spending just over 20 minutes on the pitch. Alan Connell scored a late goal for Brentford who lost 3-1 at home to Stockport County. Former Boston striker Anthony Elding scored all three goals including two penalties for the Hatters. Joe Anyinsah was a scorer as Carlisle as they won easily at Bournemouth, and Tim Sills added another to his tally as Torquay beat Droylsden. Paul Parry was also involved, crossing for Cardiff's goal in their 1-1 draw with Barnsley. Lionel Ainsworth was given an eight for his performance at Blundell Park this afternoon. The young Hereford United right winger has seldom been far behind the top mark at any game since joining the Bulls. Brown, Smith, Taylor and Beckwith all received a seven. Both sides had seven attempts at goal which were on target. Midfielder Toumani Diagouraga was the only Hereford player booked. Possession was assessed at 50% for each side. Hereford drop one place to third in the table. Graham Turner admitted in the post match press conference that Hereford paid a heavy price for a very poor first half this afternoon at Grimsby. "We never got started in the first 45 minutes. We almost made a game of it but we were inexplicably poor in the first half, passing, first touch and the simple things, we never got going at all. "Second half we gave it a go." Turner said that Grimsby were a decent side. "Although they've not had the best of starts they've got some decent players and they did look sharp. We were never as sharp as them in the first half." Turner was disappointed with the both Grimsby goals. "We should have cleared that (the first one) with it over that far side. We never dealt with it. "You set up a wall (for the second one - a free kick after Easton had fouled a Grimsby defender). People have jobs to do. I don't blame the goalkeeper. When shots go in at the near post - we've got a wall to protect that." It was a repeat of last season's encounter today as Hereford United fell to a 2-1 defeat at Grimsby; the first away points that The Bulls have dropped. A first half opener from Danny Boshell gave Grimsby a deserved lead, before Tom Newey struck a free-kick to make it 2-0. Trevor Benjamin then powered home his fifth of the season but United failed to muster up a comeback and fell to their first away defeat of the league season. The starting line up was completely unchanged from last week, but there was a place on the bench for returning international Trent McClenhan, in place of Sam Gwynne. United came out of the traps quickly, and Toumani Diagouraga was unlucky in front of goal when his guided header from a Lionel Ainsworth cross narrowly missed the target. A quick counter-attack led to Clint Easton finding space on the left hand side of the box, but his deflected shot was pushed wide by Grimsby 'keeper Phil Barnes. Grimsby looked good in possesion, but offered little up front, although Newey tested Wayne Brown from 30 yards with a rasping drive. It was Newey who was in the thick of the action as the breakthrough was made. He found space on the left hand side and delivered a fine cross towards the back post. Boshell slid in to beat Ben Smith to the ball and give Grimsby the lead. Too often, United were giving Grimsby too much room on the ball, and Grimsby had plenty of possesion in the first period. Benjamin went close either side of a Jamie Clarke free-kick which went wide. Firstly, Benjamin weakly headed at Barnes, and then he powerfully met a Easton cross from the left, but from close range, couldn't hit the target. The second half was soon rewarded with the second goal, coming in the 51st minute. Easton mis-timed a tackle, and gave away a dangerous free-kick. Newey placed the ball and managed to beat the wall and also beat Brown at his near post. The reaction of Brown made it clear that the wall should have done a better job, but the keeper will be extremely dissapointed at being beaten at his near post. United should have got right back in it, with Steve Guinan capitalising on a poor defensive head back, by beating the keeper to the ball. He took his time before shooting, but a defensive block diverted the ball onto the post and it was eventually cleared. The two goal advantage didn't last long. Benjamin pulled a goal back, after starting, and then finishing the move. He switched the play to find Easton, who held the ball up to find the overlap of Kris Taylor. The former Walsall man fired a ball across goal and Benjamin slammed home from close range at the back post. Grimsby reacted to the goal, bringing off Paul Bolland and replacing him with the fresh legs of Andy Taylor. The sub nearly paid dividends immediately, after breaking clear when Broadhurst mis-judged a header. However, a quick reaction from Brown closed the angle Taylor had to shoot at, and the goalie saved with his legs. In the aftermath of that change, Ciaran Toner smashed wide. Theo Robinson, pictured, replaced Guinan as Hereford looked to inject some pace, whilst Gary Jones was bought on to inject some power to the Grimsby attack with Isaiah Rankin making way. The experienced striker, who scored twice against Hereford last season, put an effort wide just minutes after coming on. Toumani Diagouraga, booked earlier on in the game, made way for Luke Webb, as Graham Turner looked to shake things up. After a scrappy period, a piece of magic from Ainsworth nearly forced the equalisier. He cut in from the right hand side, beating two players before shooting with his left foot; Barnes managed to get a hand to it though and push it away. Defender Ryan Bennett was bought on to help the cause for Grimsby, with Danny Boshell leaving the field. Weak efforts from Benjamin at one end, and Taylor at the other were the notable chances until the final minutes. Firstly, Webb played a clever ball through to Benjamin, but his powerful shot was deflected over before perhaps the best chance for United to equalise. Smith touched the ball into Robinson, who managed to shoot low and hard, but Barnes was once again equal to it, and saved with his feet. Grimsby held on to claim their first home win of the season, and Hereford went home empty handed. The excellent start to the away season was always going to come to and end, and today was the day. Watched by 3699, including just 138 from Hereford, Grimsby looked a solid unit, but Hereford never really looked like getting into top gear. A positive to be taken from the game could be that Benjamin has scored in every away game this season. However, his prescence, along with Guinan, was easily dealt with today, with the lack of pace helping Grimsby's defence to cope. Next up is another tough looking away trip to Notts County. Memories of Tim Sills' goal late on last season will be remembered, as Hereford look to return to winning ways. Hereford: Brown, Rose, Taylor, Beckwith, Broadhurst, Ainsworth, Easton, Diagouraga, Smith, Guinan, Benjamin. Subs: Ingham, McClenahan, McCombe, Webb, Robinson. Grimsby: Barnes, Clarke, Newey, Fenton, Whittle, Till, Toner, Bolland, Boshell, Mulligan, Rankin. Subs: Montgomery, Bennett, Bore, Taylor, Jones. Ben Smith, the Hereford United club captain, has been telling the Western Daily Press about how he feels about Hereford's good start to the season. "We have made a good start to the season and it's great to have 14 points on the board. "But, as yet, we don't know the relative strength of the teams we've beaten or whether they are going to be strong promotion candidates. "We have the ability to beat anyone in this division and this will be put to the test during the next month or so. "Grimsby have struggled a bit, but I don't think you can read anything into that. "We have nothing to fear and will go there to play our passing game and come away with the three points. "What we mustn't do is get sucked into their style of play. (We must) concentrate on our own game, which teams don't like in this division. "You look to improve on your previous season and I believe the new players have strengthened the squad. "All the players can be regarded as first-teamers, everyone wants to be in the starting line-up, and there is plenty of competition for places. "So if there is some rotation in the team, it doesn't weaken the side." For the second time recently former Sheffield United manager Neil Warnock has gone out of his way to heap praise on Hereford United manager Graham Turner. In his 'What I've Learnt This Week' column in the Independent he writes about his manager of the year so far. "For my manager of the year so far you have to look to the Fourth Division – sorry, I can't get used to all the name changes, I mean League Two. I'm thinking of Graham Turner, at Hereford," wrote Warnock. "I met Graham at a function a few months ago. I told him how much respect I had for what he's done. People may recall he left Wolves in 1994. The following year he took over at Hereford but he couldn't stop them falling into the Conference. He ended up, when the chips were down, buying the club and taking over as chairman. Now they are back in the League and pushing for promotion. I can't get over what how well he has done, and I don't think anyone can meet a nicer man. And that's not so common in the modern game. Maybe that why I've had a decent career." Graham Turner, the Hereford United manager, has spoken to several reporters this week and in all the subsequent articles Turner's high degree of confidence in the current squad is one of the main highlights. "All in all we've got probably, argueably, the strongest squad, the most experienced squad we've had for quite sometime," he told BBC Hereford and Worcester. "That has helped them all gel together. Get that understanding between little groups of players - striker partnerships, centre-half partnerships those sorts of things." No injury problems have been reported in advance of tomorrow's game at Grimsby and so Turner may decide to start the game with an unchanged eleven. Meanwhile those brave supporters travelling to Grimsby may have to watch the match in cool conditions. A gusty north wind is expected with temperatures around 12C. Yeovil winger Marvin Williams will miss their trip to Edgar Street in the Johnstones Paint Trophy after needing surgery on an ankle injury. Notts County have signed defender Michael Byron. Byron, 20, has signed a deal until the end of a season after impressing in a trial. Wycombe are hunting a loan keeper after both senior keepers were ruled out for several months. Jamie Young was already missing when Scott Shearer broke an ankle in training. The club have just their youth team keepers left. Peterboro have loaned defender Adam Smith to Boston for a month. MK Dons have loaned teenage defender Sam Collins to Kettering for three months. Brentford have loaned teenager Karle Carder-Andrews to Margate for a month. Ex-Bull Chukki Eribenne will miss a month for Ebbsfleet after picking up a hamstring injury. Wrexham are to sign Stoke midfielder Robbie Garrett on a three month loan. The 19 year old played a part in their survival campaign last season. Mansfield are to sign Sheff Weds midfielder Sean McAllister on a months loan to cover for injuries. The 20 year old has started just two games for the Owls. Barnet Football Club await the outcome of a council planning meeting on October 8th when the future of the club may be decided. On that date Barnet Planning Committee meet to decide on a planning application submitted by chairman Tony Kleanthous on behalf of the club for new stands at the North and South ends of Underhill, for new floodlights and for improved disabled facilities. The football club need to bring their facilites up to League Two standards. Should the plan be approved work will start on a covered South Stand - the requirement is for 2,000 covered seats at the ground - to be in place by the end of the season, plus part of the work on a covered North Stand for away supporters and much needed facilities for the disabled. If the plan is not approved then Barnet will need to try and find another club able to share their facilities. In the long term Barnet aim to move to a new stadium with a capacity of 10,000. Funbus departs at 8.45 (ish) and still has a couple of spare seats. Fare will be about £15. Contact Rodders on the forum. Graham Turner has told BBC Hereford and Worcester that he is surprised at the success of the team so far this season considering how late they came together in pre-season. "The start we've had has been very pleasant and a little bit surprising because of the time it takes for people to gel, to get that understanding," said Turner. "But I've got to say when you look through the quality compared with previous seasons, we got players with experience in there. One or two have played at the highest level." Meanwhile on Five Live last evening the sports editor at BBC Hereford and Worcester, Trevor Owens, was asked about refreshments at football grounds. Owens has covered a lot of Hereford United games over the years. "I've spent most of my life doing League Two and the Conference or its equivalent so I've experienced some fairly horrendous food at sometime or another. "I seem to remember at Tranmere Rovers was pretty dreadful when I went there on New Years Day once in the mid-eighties. "I think the tea had been dredged from the Mersey. "The best at Mansfield Town where they had the best pasties in the League by a country mile." Rotherham expect to break even this season, after losing £1.8million last season. Chairman Denis Coleman told the local paper: "We are not breaking even on a weekly basis but you get Sponsorship deals and Football League money throughout the year. If we can get the gates up then we will be in a healthier position but the gate sizes don't pay half of what we need in this club. We have taken a pessimistic view on the gate sizes and budgeted accordingly. "At the beginning of last year this club had debts of several hundred thousands racked up, was losing £140,000 per month and was days away from going into liquidation. We simply had to attack it the best way we knew how which, in our case, was looking at the excess costs and trying to reduce them while working as hard as we could to try and increase the income and revenue. "We haven't always got it right and there are untapped streams of income we should have got into which we haven't but the facilities here hold us back and, due to legal reasons, we can't make the most use of them." "The board are putting a lot of time and energy into running this club and keeping it going. When I hear supporters having a go it is very disappointing. There will always be rumours, but half of them are not even worth responding too. I can only imagine that the people who make up these stories have nothing better to do with their time. "I have felt so strongly about it over the last eighteen months that I wonder, is it worth it? It is only my pride and the love of Rotherham United that stop me from walking away." "I remember travelling up there, I didn't really want to sign for them as they had a policy of playing you in the reserves I wanted to get into the first team straight away! I was in digs in Anfield so I used to go and watch Everton when I wasn't playing, I saw the young players coming through, people like Adrian Heath, Kevin Ratcliffe & Kevin Richardson, I just made it known through the local paper that I wanted to move, my contract was up and this alerted Everton. I got a call from Howard Kendall towards the end of my contract shall we say, to see if I was interested in joining Everton and knowing the potential there I jumped at the chance. Liverpool wanted me to go to Blackpool, certainly not Derby or Everton (who were both interested) they wanted to dictate where you went to so that the move would not benefit a rival. I dug my heels in, waited for my contract to run out then made my choice. Howard didn't need to sell it to me, I'd been to the games, tasted the atmosphere and knew it was a massive club and it was on the doorstep, I knew Everton were the team for me!" Following his £100,000 move to Goodison, the left-winger was instrumental in Everton's success in the 80's, winning the FA Cup and League Championship double in 1984, the European Cup Winners Cup in '85 and the Football League again in 1987. He also collected 45 International caps for The Republic of Ireland including appearances in the World Cup and European Championships notably scoring against England in Italia '90. Following his time at Everton Sheedy joined Newcastle under Kevin "I would just love it" Keegan and later moved to Blackpool. Since hanging up his boots Kevin Sheedy spent time coaching at both Tranmere and Hartlepool before returning to Everton where he is now an Academy Coach with the 17/19 year old players. According to the Official Everton site; "Everton legend Kevin Sheedy assists in the development of technically excellent players for the full-time Academy player programme. He is involved in all technical work, the monitoring of youth players' performance and organising and implementing one youth team, including preparation, matchplay and recording." All a far cry from Widemarsh Common! Hereford United's Youth team were defeated 3-2 at Bishop's Cleeve this evening in a Midland Floodlit Youth League Southern Division game. Meanwhile Colin Williams, who helps run the Youth Team, is currently out of action having had a hip operation. Finally the 'official' Hereford United youth team game against Exeter on Saturday has been postponed. Graham Turner has told the Worcester News that confidence is high at Edgar Street in advance of Saturday's match at Grimsby and Tuesday's at Notts County. "It's a terrific record to start the season with three consecutive away wins. "We'll go up there with the same spirit and determination, the same organisation and there's no reason why we shouldn't take good points from these two matches. "The first thing is to go and address the Grimsby match, put on a performance like we've been doing and take the three points there and then we move on to Notts County. "Grimsby had their first win of the season at Lincoln last Saturday and I thought it was a very good victory in a local derby for them. "We've had trouble at Grimsby in the past and we've got to go up there with the same sort of spirit that we've shown in the previous three away matches." Meanwhile, according to BBC Hereford and Worcester, Turner has no injury concerns in the squad but may have to decide whether to bring Trent McClenahan back into contention for a starting place. Graham Turner has interviews for both The Sun and BBC Sport published today. The Sun article (reproduced by the tea-total Wellsie, as it has not appeared on the Sun website), with Chris Kamara, is a jokey affair that compares Turner to Roman Abramovich: "Like Roman, I only answer to God!. But seriously, we are not in the same league - the only thing we have in common is we are both our own bosses. I know what I can and can't spend, whereas money is no object to him and I can't hide. I do have a boss - the fans. They are the people I answer to, whereas Roman will be unconcerned what the Chelsea supporters think. "I would never dream of sacking a manager who had been so successful as Mourinho. Chelsea have made a drastic mistake. I apply the same principles with myself as every Chairman-owner should when he appoints a manager - let him manage." The BBC Sport article focuses on the start to the season, and the way the squad has been assembled: "We needed to add that little bit of experience. It was a deliberate policy to try and bring in one or two with experience, like Clint Easton, Trevor Benjamin and Karl Broadhurst, players that have played 150-200 league matches at a higher level. It's surprised me a little bit at how we have gelled as a team. But we are looking very solid. Last week's game against Bradford was significant because I think they will be up there challenging for promotion. They will be one of the better teams so there was a significance to the result, above the three points. "The easy part is getting up there. The hard part is staying up there. But there is more to come from them. We take encouragement from clubs like Colchester and Southend, who have fought their way to the Championship. I know Southend did not stay in there long but Colchester have done very well. There is a place for the smaller teams, who mean a lot to their supporters." Life at Torquay appears to be suiting Tim Sills. The former Hereford United striker has already bagged eight goals this season but still beleives he can perform as well in the League. "You don't score all those goals in the Conference without believing that you can score more of them higher up," he told the Herald Express. "It would be lovely to do it with a club that you've won promotion with. "So I'm keeping my fingers crossed that the dream can come true with Torquay." Sills, well aware that that he only scored three goals in eighteen months with both Oxford and Hereford, remembers his time at Aldershot when he scored 46 goals in 102 starts. It was there he worked for a short time with his new manager Paul Buckle. "When Oxford came in for me (January 2006), it was the right time. If I had signed another two-year contract at Aldershot, I could probably have forgotten it. "Brian Talbot signed me at Oxford and, although the goals weren't flowing, I enjoyed playing and training under him. "Darren Patterson took over for a short while, but then the takeover happened and it all went to pot after that." Then he moved to Edgar Street and League football. "I played most of the games until Christmas and, although I was playing well, the goals weren't coming," he said. "When you haven't gone up with a club, it's harder. And a striker with half a name for himself is always going to be made a scapegoat if the goals don't come. "It was definitely a frustrating season. "I'll be honest and say when I first had a shout that Torquay were interested that the location did put me off a bit," said Sills who had moved to the Hereford area. "Managers are always going to speak well, because they want you to join, but Paul certainly did. "In the time I had known him at Aldershot, he had made a big impact on me personally. And I had heard what he was like on the staff side from a couple of mates at Exeter. "I brought the family down to look around and have a chat with Paul face to face, and the rest is history." "Last season I didn't really play much football from January onwards, so I now feel as fit as I've been for a quite a while. "If I can get to ten goals by Christmas, I'm always delighted, because you're then on for 20 for the season and all strikers aim for that. "So having eight already - well, you've got to be pleased with that." Graham Turner has spoken about his disappointment that the current attendances at Edgar Street are not higher despite Hereford United playing so well. "The one big issue on Saturday was the attendance and it is a concern that we were getting better attandances in the Conference," he wrote in his Hereford Times column. "We had returned to Edgar Street on the back of a 3-0 victory at Morecambe, were nicely placed in the League and with a big and attractive club visiting - one that was in the Premiership not so long ago- yet we barely mustered 2,700 of our own supporters. "We are not attracting fresh support through the gate and that is disappointing given all the circumstances of last Saturday. "People may assume that this is a moan about the level of support but, take it as you wish, it is a concern that we were getting better gates in the Conference and it is difficult to understand why." Meanwhile the paper reports that the reserves beat Team Bath 4-1 in a behind closed dorrs friendly at Edgar Street on Tuesday afternoon with goals from Simon Johnson (2), Craig Jones and Luke Webb. Two young Hereford United players nearly joined Bromsgrove on loan last week but the paperwork wasn't completed in time. Both Jordan Fitzpatrick and Marcus Palmer were set to join the Worcestershire club but it now looks as though that deal may not go ahead after all. "The paperwork (for Fitzpatrick and Palmer) didn't go through in time, and Hereford did not want them to play in the FA Cup anyway," said manager Rod Brown who tried to sign the pair as cover for several players with injuries. Bromsgrove have an FA Cup game against Nuneaton on Saturday. "I am going to go into this weekend's game with the squad I have, and review it again next week," said Brown. A coach load of Cardiff City supporters returning from their Cup win at the Hawthorns last night had to make a hasty departure from their bus when it caught fire on the M5. They were on their way back to South Wales on a Veolia coach when the bus caught fire on the southbound carriageway of the M5. "Our driver was contacted by the bus behind to say the exhaust was catching fire. As we pulled over, thick black smoke was coming in," said one supporter as reported by the Western Mail. "I was sitting on the front seat of our coach and it looked as if liquid was coming out of the coach in front on to the road and sparks were flying," said another. "Our driver rang the driver of the other coach to tell him to pull over. Thick black smoke started coming out of the bus. "People were playing ring of fire on their mobiles and just joking about it really. Veolia, a French-owned company, was unavailable for comment. Another of their coaches, on this occasion carrying school children, was reported to have been involved in a smash on the Herefordshire border on Monday. Accrington have re-signed midfielder Ian Craney on loan for three months. Craney signed for Swansea from Stanley for £100,000 less than a year ago, but has drifted out of contention under new boss Roberto Martinez. Notts County have extended the deal of teenage goalkeeper Tim Sandercombe for a further year. Macclesfield have retained the services of teenage striker Gareth Evans for a further month. The former trainee signed a one month pro deal last month, making six sub appearances and scoring once. Ex-Bull Stuart Fleetwood has denied reports linking him with a return to the Football League after he took his tally to eight in 12 for Forest Green. He told the local press: "I'm settled as I am. Clubs can look at me but I'm a loyal player and I'm here until the end of the season." Several former Hereford United players, now with Conference clubs, have hit the back of the net this evening. Both Stuart Fleetwood and Mark Beesley have scored a brace for Forest Green Rovers in their game against Stevenage which ended 4-2. Former Trialist Chris Zebroski scored for Torquay in their 3-2 win against Weymouth. Meanwhile Neil Grayson keeps hitting the target. Now with Phil Robinson's Stafford, 42 year old Grayson played for Hereford in the 97/98 season. This evening he scored the only Stafford goal in their 1-1 draw at home to Histon. A successful striker in his own right, Grayson was Graham Turner's only buy as Hereford United boss costing £20,000. Despite making an eventual loss on the player, Cheltenham Town only paid £15,000 back for him, Grayson almost averaged a goal every two games during his time at Edgar Street. Finally League Two Morecambe were defeated 5-0 by Sheffield United in the Carling Cup. This coming Friday is the Annual Macmillan Coffee Morning. The World's Biggest Coffee Morning is one of the biggest fundraising events in the UK, with an estimated 2 million people raising their mugs for Macmillan Cancer Support last year. And this year they hope even more people will get involved. In Herefordshire there is an extra reason to join one of the events that is to help raise the money to build a state-of-the-art cancer unit in Hereford. So please - Make the time, To Make the coffee, To Make money for the Macmillan Renton Appeal. Meanwhile the NFU Mutual who insured the car park organised by Bulls News and run by Hereford United supporters for the Macmillan Renton Appeal at the Hay Festival last May have refunded the premium paid and added an equivalent amount as a donation towards the Renton Appeal. Mansfield Town's four main supporters groups are to unite on Saturday for a protest against current owner Keith Haslam. TEAM Mansfield, Stags Fans For Change, Stags Supporters Association, and the Ollerton Stags Supporters Club will join forces for a protest outside the ground prior to Saturday's match with Dagenham, before continuing with the protest during the game inside the ground. The supporters claim that Haslam has lined his own pockets during his 14 year ownership of the club, and is asking an unrealistic amount of money for the club. Current chairman James Derry is the only acceptable bidder to Haslam, and has complained publically about the length of time it is taking for the deal to be completed. Haslam himself has responded to the announcement of the protests today by stating that he will never attend another home game - a decision, he claims, made after the last home match on the 15th September. In his weekly interview Hereford United manager Graham Turner has spoken at length about how matters are progressing with the development issues. "We went over to Wolverhampton last Wednesday to see an architect over there. What we basically want is that he'll be selected to look after the football facilities around Edgar Street and make sure that it's right for supporters," said Turner as reported on the Official Website. "We're hoping to have a meeting with the big hitters from the Edgar Street Grid, the Council planning department, the Richardson's and the architect. It's a busy time. "I'm getting ever so frustrated with it all, I've said before that I'll be disappointed if we don't get a planning application in before the turn of the year, I still think that's a target that is achievable, but we need to be moving things on. "I'm told, by the Richardson's, that there is a lot of interest from a variety of companies that want to get involved, cinemas, hotels, fitness centres, retails, residential, plenty of opportunity I'm told, but we'd like to move it on further and get something into the planning stage soon. "What we'd like to do is the configuration of the terracing, stay as standing at the moment, with the provision that we can put seats in at a later date if we wanted to. "There are moves now to try and bring controlled standing areas behind goals, even at Premiership grounds, they've done it in Germany successfully where they do have standing areas for their domestic football. "I'm told by the Football Licensing Authority that it will never ever come about [In England] it will always remain seating, the higher up you go, the Premiership, the Championship, it's got to be seated. "There are so many supporters who want to stand, that enjoy standing, we don't particularly want to force the issue here and have to put seats in, we'd rather leave it as the supporters wish, and that is terraces to start with. "Bearing in mind that we should, whatever is developed around here - we owe the million pound to developers, that's obvious, that's got to be taken care of - but there should be some profit in it for the club from whatever is put on the ground, and that should stand the club in good stead for the future as far as finance and viability is concerned." Travel Info for the long trip to Grimsby. "The Mariners" were formed in 1878 and were originally known as Grimsby Pelham. The following year they changed the name to "Town" and purchased land at Clee Park that became their ground until 1889. 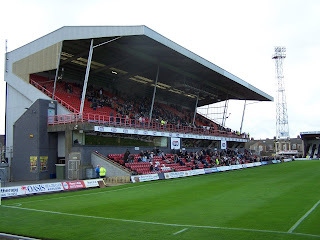 A one-year stay at Abbey Park was followed by a move to the present site at Blundell Park. The Stadium currently has a capacity of 9546 and is all-seated. Visiting fans are accommodated in the Osmond Stand at one end of the pitch and admission is quoted on their Official Site as being Adults £18, Senior Citizens and Young Adults (15-18) £12 with Juniors at £8. Fans are reminded that a biting wind from the North Sea can make a visit a chilly affair so take a coat! M5, M42, A42, M1 north. 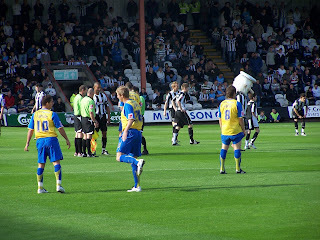 Refreshments – The Leaking Boot is a favourite for visiting fans and can be found just four hundred yards passed the ground. For the more adventurous, carry on to the end of Grimsby Road and then bear left and continue onto Alexandra Road then High Cliff Road where you will find Willy's Pub and Brewery. The world's smallest Pub is the claim of The Signal Box at Lakeside Station in Kings Road and it serves several of the excellent Tom Wood range of real ales. Jennings Cumberland Ale can be found in the Trawlerman in North Sea Lane whereas the 2007 Camra Pub of the year in Cleethorpes is No 2 Refreshment Room at Cleethorpes Station. There is a MacDonald's next to the ground and several legendary fish and chip shops nearby. In particular, Josh's near to The Leaking Boot is highly recommended. Ray Lee from Brentwood, Essex has been appointed to referee Hereford United's game at Grimsby next Saturday. Lee has been in charge of six games this season to date including three Division One games. He has given out 16 yellow but no red cards so far. The last time he was in charge for a Hereford game was at Peterborough last April. On that day he kept all his cards in his pocket. Meanwhile Grimsby are giving supporters the chance to win two tickets for next Saturday's match. Here's a chance for you to win two tickets for Saturday's clash against high-flying Hereford United. To be in with a chance of winning the tickets, in the stand of your choice, simply answer the question below. Which former Town player signed for Hereford during the 2005/06 Season? Texts cost 25p each plus your normal network charges. Competition closes miday next Friday (28th). One Winner will be selected at random and will receive two tickets to the game. Clint Easton has been named in the League Two Team of the Week for the second successive game. Easton earned the award for his performance against Bradford on Saturday, with the Bantam's Guylain Ndumbu-Nsungu also being recognised by the panel. Easton joins Lionel Ainsworth on two awards this season. Grimsby goalkeeper Philip Barnes was also named in the side ahead of the Bulls trip to Blundell Park. Rotherham have signed teenage defender Ryan Cresswell from Sheffield Utd on a three month loan as cover for injuries. Darlington boss Dave Penney has ruled out a move to Sheffield Wednesday with current Owls boss Brian Laws on thin ice. Bury have loaned midfielder Dale Stephens to Droylsden for a month. The teenager has played once for the Shakers this season. Ex-Bull Scott Goodwin is on the move again. The former Coventry trainee has joined Unibond Division One (South) side Quorn as a direct replacement for fellow ex-Bull Rob Betts, who is injured. Peterboro have signed Luton full back Sol Davies on a two month loan deal. Davies, 28, made headlines last season after suffering a stroke on the team bus prior to a match, missing two months of the season. He is expected to make the move permanent in the January transfer window. Rochdale have extended the contract of David Perkins until the end of next season. A transfer tribunal has awarded Mansfield a deal worth up to £70,000 for former midfielder Giles Coke, who left for Northampton in the summer. The deal sees £30,000 paid up front in two installments, plus £40,000 based on appearances and a 20% sell-on clause. He is yet to appear for his new team due to injury. The Stags have signed Hartlepool midfielder Lee Bullock on a months loan. Grimsby have added striker Nathan Jarman to their squad ahead of the Bulls' trip to Blundell Park on Saturday. The 21 year old former Barnsley trainee was released by the Oakwell club in the summer, making three starts and sixteen sub appearances without scoring, and has signed a one month deal for the Mariners. The Mariners forward line has struggled for goals so far this season, with midfielders Ciaran Toner and Paul Bolland scoring five of the club's eight league goals so far this season, but they had only two named strikers in a paper thin squad of 19 prior to Jarman's arrival. Bulls fans may recall the issue regarding former HUFC Director Dave Preedy and his removal from the Board due to him not having the required shareholding. Preedy, a local man and long-time Bulls supporter runs a business specialising in plumbing, bath and shower-room fittings was invited to join the Board by Graham Turner before the commencement of the building of the new changing room/shower extension. Shortly before the last AGM and after completion of the new changing rooms, Preedy was informed that his Directorship was not valid due to the shareholding qualification. He was told he needed to acquire the minimum number before his Directorship could be confirmed. Bulls News understands that Mr Preedy has now purchased shares from another long-standing supporter and VP Club member but, as yet, has not been invited back onto the Board. It is believed that the previous owner of the shares agreed to sell to Preedy solely to enable him to join the Board. Meanwhile, it has been noticed that Mr Preedy nor his wife have attended any home games this season despite previously being involved in the hospitality offered to visiting Directors. It is not clear at this stage why Graham Turner should say that Preedy has no shares when it seems that he does and, indeed, has done for some months. Neil Warnock has recently released his auto-biography called Made in Sheffield and in it he writes about his first game as a manager with Scarborough in the (then) Fourth Division. "The fixture computer gave us Wolves and they brought thousands with them. It was a bank holiday so they'd all been on the beach all morning drinking and having a laugh. "It was a great atmosphere when the game started but it always felt like it had the capacity to get a bit tasty and, sure enough, when half time came around, it all kicked off. "We had gone ahead but they equalised and Steve Bull put them in front. "During the interval, the Wolves fans set about destroying new toilets we had put in for the away supporters. They were smashing the hell out of them. One bloke climbed up onto the corrugated iron roof of the stand and started jumping up and down. "Next thing you know, the idiot's fallen straight through it. An ambulance crew took him off to hospital. He discharged himself later, which amazed me. "Because he was so pissed, the medical people said his body was relaxed when he hit the floor and it limited the damage. "The ref was talking about abandoning the game because of the crowd trouble so before the teams came out for the second half, they asked me and the Wolves boss, Graham Turner, to walk over to the away fans to pacify them. "As I was walking over towards them, I could tell that a lot of them were pretty smashed. "We got to within about thirty yards of where they were standing and suddenly this Coca-Cola can came flying through the air out of nowhere and just missed my head. I picked it up and it was full of sand. It was like a piece of concrete. "He was a bit timid, Graham, and he looked aghast." "I think we'd better leave them to it," he said. "He turned on his heels and trotted off. "He was one of the nicest people you could ever wish to meet in football so I trotted off after him. "They let the game continue eventually. It finished 2-2." Later in the book he writes about playing Hereford in the Autumn of 1995. At that stage in his career he was with Plymouth who had just been relegated to the Fourth Division. His memory isn't quite as it should be as regards the facts. "By the fouth game I knew Hammond had gone. His confidence was absolutely shot. "They were right down in the mire (not really they were 9th - ed) with us and that match should have been a home banker (never - ed). "We played well enough. Going forward, we were fine, but I was nervous every time they got near our goal. Not as nervous as Nicky Hammond, unfortunately. "Late in the game Hereford got a long throw and Nicky told the defence he was going to claim it, come what may. You can't do that. Not before you know where it is going. Anyway, he came for it, got nowhere near it, someone flicked it on and a lad called Steve White scored the winner. "So there we were: four games, four defeats, no points." Neil Warnock - Made in Sheffield - is published by Hodder and Stoughton. A selection of comments from both the Hereford and Bradford managers after yesterday's game at Edgar Street. Hereford manager Graham Turner said: "It was a cracking game against good opposition who caused us a few problems. But our performance was first class. "I thought we created a lot of opportunities, good movement and passing. We did all the things we didn't do against Macclesfield. I thought we deserved the win. "It was more than just three points as they were one of the fancied sides. It was a severe test of whether we're capable of being in contention for a play-off place and we've come through it." Bradford manager Stuart McCall said: "We gifted them their first three goals. "We did get chances in the second half but all in all if you give three goals away you are not going to win matches. "You have to hold up your hands when they scored their fourth on the break but you have to expect that when you are chasing the game. "No disrespect to Hereford but we shot ourselves in the foot." For those who wish to see Hereford's four goals the highlights from yesterday's game against Bradford at Edgar Street will be on ITV's football programme starting at 11am. Virgin Media's usually slightly longer highlights should be uploaded to its website for viewing tomorrow morning. There is a link on the top left of this site. Sky normally have a review of League games on a Monday evening commencing at 7pm. Looking forward to Hereford United's next game at Grimsby next Saturday, coach John Trewick noted that League Tables can sometimes lie. Grimsby are currently 18th but defeated Lincoln 2-1 today at Sincil Bank. "Grimsby won't be a bad side next week," Trewick told BBC Hereford and Worcester. "But if we go there and play the same sort of stuff as last Saturday and this Saturday, we can play anybody in this League. "It's really all about what we do." Last season the equivalent game took place on a Sunday and was televised on Sky. Grimsby won 2-1. Hereford United are joint top of League Two this evening along with Darlington, Chesterfield and Shrewsbury. It's a long time since the Bulls were top of League Two. In fact it was back in September 1984 when this last happened. John Newman was the manager and after seven games the Bulls were top of the League Division Four as it was called at that time. The Bulls had won six of their first seven games and had they won their next game, against Chesterfield, would have broken a Football League record. Stewart Phillips was top scorer with four from the seven games. Meanwhile youngster Craig Jones was on target four times in the Young Bulls 3-1 victory over Cheltenham Youth this morning. However one was an own goal. Hereford United had an excellent return of four goals from nine shots on target this afternoon in the game against Bradford who had eight shots on target from which they scored their two goals. Possession wise the Bulls were given 52% against 48% for the Bantams. Both Dean Beckwith and Steve Guinan were booked. However Guinan's card was easily avoidable as he simply failed to move back for a Bradford free kick. Toumani Diagouraga was given an eight for his efforts. Beckwith, Smith, Ainsworth, Easton and Guinan each received a seven. For Bradford goal scorer Ndumbu-Nsungu was awarded an eight. Hereford United had to work hard to claim their first home win of the season, but did so with a 4-2 defeat of Bradford City. First half strikes from Toumani Diagouraga and Steve Guinan gave United a comfortable advantage, before Guylain Ndumbu-Nsunga pulled one back before half time. However, a penalty from Trevor Benjamin in the second half gave Hereford the two goal advantage once more, but again, Ndumbu-Nsunga pulled another back, before Theo Robinson tucked in his fourth of the season, and Hereford's fourth and final goal of the game. Graham Turner decided against any changes from last weekend's starting eleven at Morecambe, despite slight doubts over the fitness of both Guinan and Benjamin up front. Robinson replaced Simon Johnson on an otherwise un-changed bench. Notable names lining up for the away side included the experience of David Wetherall and Peter Thorne, whilst Barry Conlon, who scored against United for Mansfield last season, took a place on the bench. Like previous home games, Hereford came out of the traps quickly with Clint Easton having a long-range effort tipped wide by Bradford goalkeeper Donovan Ricketts. The resulting corner was met by Dean Beckwith, but his effort went over. At the other end, Thorne met a cross from Joe Colbeck, but put it wide of Wayne Brown's goal. The opener came in just the 15th minute, after good work from Easton on the left hand side. He controlled and spotted the run of Diagouraga, and passed the ball into the path of the midfielder. The Frenchman, on loan from Watford, managed to get past the defender before tucking the ball under Ricketts and send the Meadow End into raptures. Minutes after the opener, and United doubled their advantage. After some good pressure on the Bradford area, Richard Rose put in a deep cross from the right hand side and it was met by Guinan. Despite the header coming from a tight angle, the power was too much for Ricketts and it was 2-0. Bradford reacted to the shock of conceding two goals in little over three minutes, and went extremely close to pulling one back. The lively Omar Daley cut in from the left hand side, and played a ball to Ndungu-Nsunga, who struck powerfully against the crossbar but luckily, the ball was cleared. Minutes later though, not so lucky for United, Bradford pulled it back to 2-1. Eddie Johnson found space in the middle and fired a low shot towards goal. The ball deflected off Ndumbu-Nsunga and past the helpless Brown. The pressure mounted on Hereford, as Bradford gained confidence, with both Johnson and Daley spurning half chances. On the stroke of half time, good link-up play between Ben Smith and Lionel Ainsworth gave Smith the chance to shoot, but his effort was weak and straight at Ricketts. The second half started with an easy save from Brown from a Thorne half volley, but in the 52nd minute, Hereford were awarded a penalty. Smith poked a pass to Ainsworth, who managed to touch it past Heckingbottom. The former Sheffield Wednesday full-back pulled at Ainsworth's shirt, and it was spotted by both the referee and the linesman. Up stepped Benjamin to power the penalty into the back of the net and restore the two goal advantage. That advantage lasted for just seven minutes though, as Ndumbu-Nsunga notched his second goal of the game. Quick thinking, and a huge throw out from Ricketts was met by Thorne's head and the ball fell in the path of Ndumbu-Nsunga. The Congo striker used his pace to beat Broadhurst, before touching the ball past Brown from an acute angle. Kyle Nix and Conlon took to the field in the places of Colbeck and Daley, whilst Robinson was introduced, with Benjamin making way. Despite the changes for both sides, neither created any notable chances until relatively late on when Paul Evans, once rumoured to be a target of Turners, placed a free-kick wide. Luke Webb then came on for Ainsworth, and within minutes, United wrapped up proceedings. A fine counter-attack, saw Rose burst out from right back and find Diagouraga down the right wind. He spotted Robinson in acres of space in the box, and found him to perfection. Robinson's first touch took him past Ricketts, and he then took his time, before firing into the net. Soon after, Robinson had an effort fantastically tipped over by Ricketts after good work from Webb, before Webb himself should have grabbed his second goal in as many appearences, after good work from Diagouraga, but Webb's strike was tipped away by Ricketts once again. In stoppage time, Thorne had a low shot saved by Brown's legs, before the referee signalled the end to an entertaining game. For the first time this season, Hereford win at home, against arguably, the best opposition they have faced. The win, which sees The Bulls move up to 2nd place meant that it's the first time they have won back to back league games since mid-February. Next up is two away trips to Grimsby and then Notts County, and with Guinan, Benjamin and Robinson all scoring today, United can pin their hopes on their strikeforce when they play these games. Hereford: Brown, Rose, Taylor, Broadhurst, Beckwith, Ainsworth, Easton, Diagouraga, Smith, Guinan, Benjamin. Subs: Ingham, McCombe, Webb, Gwynne, Robinson. Bradford: Ricketts, Harban, Heckingbottom, Wetherall, Bower, Colbeck, Daley, Johnson, Evans, Thorne, Ndumbu-Nsunga. Subs: O'Brien, Williams, Phelan, Nix, Conlon. Hereford United's Graham Turner and John Trewick have been asking for goals at home, this afternoon their request was answered. And as John Trewick told BBC Hereford and Worcester after the game today wasn't good for the grey hair or the blood pressure. "It was end to end stuff. Both teams looking to play. Both teams having superiority at times during the match. But I thought we deservedly won," said Trewick. "Their keeper made two or three good saves as well as the goals we scored and we had numberous other opportunities - they had one or two as well. "Great win for us - they're not a bad side Bradford but we'll take the three points. "We had a great start. For the first twenty minutes we were very very good. Had we continued in that vein we have scored seven or eight goals. "It was disappointing to concede two goals, but if we score four every week and concede two I don't care." Reminded by Keith Hall that all three strikers scored Trewick said it was good for confidence. "I think that is Steve Guinan's first of the season. He's been working his socks off. Trevor, I think, has got his fourth. "And Theo has come back in and scored a cracking goal. I think it was Toumani down the right hand side did ever so well and got a great ball across the face of the goal." "Everybody is contributing at the moment - it's fine." Darlington continue to top the table despite losing 1-0 at MK Dons. Third placed Chesterfield also lost 1-0, to Barnet, while Shrewsbury's 1-1 draw with Wycombe was enough for them to be the fourth team at the top with 14 points. Brentford moved up to seventh after beating sixth placed Chester 2-0. Peterboro are still struggling for form after only drawing at home with Morecambe, 1-1. Accrington pushed Mansfield into the relegation places as they beat them 1-0 in from of just 1,408. Dagenham and Bury shared the points in a 1-1 draw, leaving both sides just out of the bottom two. Grimsby won 2-1 at Lincoln to leapfrog their local rivals at the wrong end of the table. Rochdale drew with Macclesfield 1-1, and Rotherham and Notts County also shared a 1-1 draw. Stockport beat Wrexham 2-1 to leave the Dragons at the foot of the table with just three points. The Bulls recorded a healthy 4-2 victory over Bradford City in today's League Two match at Edgar Street, moving the club into second in the table. The home side scored twice in four minutes early in the first half, thanks to Toumani Diagouraga and Steve Guinan, and barely looked back after that. Bradford did score twice, and smashed one off the crossbar, but the Bulls won with some spare left in the tank thanks to second half goals from Trevor Benjamin and Theo Robinson. The anticipated 1,000 man invasion from Yorkshire was announced as being just 512 out of a disappointing crowd of 3,275. Those that stayed away missed an action packed six goal match, with four more goals ruled out. The BBC has a curious story, as reported on the Altrincham website, about how "A football fan cycled 170 miles to watch his team play only to find himself locked out of the ground. Peter Woor, 57, a lifelong Cambridge United fan, pedalled for 12 hours to cheer on his team as they played Altrincham FC last Tuesday. However, he got lost in Leicester and by the time Mr Woor got to the ground the gates were closed. 'It's a sorry tale. I was really upset because of the 3-0 win I missed', said Mr Woor, of Fulbourn, Cambridgeshire. Mr Woor started out at 0745 and got to the gates at 2020. He said: 'They usually open up the gates at half-time but they must have kept them banged up in there - it's a rum place. No one heard my shouts so I went to a pub across the road. The locals were amazed by my tale and bought me a pint'. Mr Woor, a lab worker at Addenbrooke's Hospital, finally got in with 20 minutes left but missed United's three goals. He said:' I have cycled a total of 8,000 miles to 56 different grounds. I have been late before but I've never been locked out'. 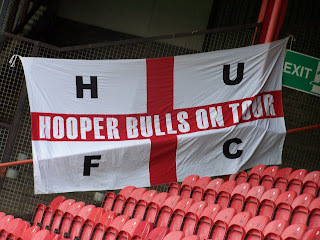 The HUISA bus for the away match at Grimsby next Saturday will depart the club at 9am, and will cost £18. Hereford United's Youth Team (Under 18's) play their second game in the Puma Youth Alliance Cup Groups tomorrow (Saturday). The young Bulls entertain Cheltenham Town with an 11am kick-off at the City Sports Ground. There are seven clubs in the group: Hereford United, Wycombe, Exeter, Cheltenham, Northampton, Rushden and Diamonds and Peterborough and over the next few weeks they all play each other. Last Saturday an under-strength Hereford side were beaten 8-0 at Wycombe in the first game in this cup competition. Former Hereford United goalkeeper Chris MacKenzie has joined Kidderminster Harriers on loan for a month from Shrewsbury Town. Mark Yates, the Harriers manager, needed cover as he is without both his regular keeper Scott Bevan and reserve keeper Dean Coleman for tomorrow's match. 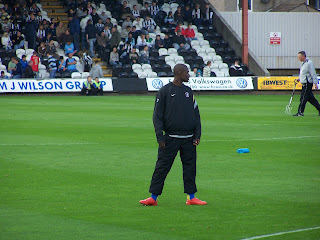 MacKenzie, who is also a goalkeeping coach at the New Meadow, spent three years early in his career at Edgar Street. Ahead of tomorrow's Hereford United game against Bradford, BBC Sport is reporting that both Steve Guinan and Trevor Benjamin have had ankle injuries but should be able to start. Theo Robinson is understood to be fit and Trent McClenahan available for selection. It's unlikely that manager Graham Turner will make big changes to the squad that defeated Morecambe last Saturday but McClenahan and Robinson are expected to be back even if only on the bench. UPDATE 5.30pm: BBC Hereford and Worcester have reported that Theo Robinson is unlikely to feature tomorrow - they say that he hasn't trained this week. Meanwhile Bradford are expected to bring the largest away following to Edgar Street, so far this season, for the match. At least 800 supporters are thought likely to travel. The Confguide forum is to get a makeover, apparently ditching the forum style loved by so many. As a result, all posters are having to re-register on the new forum when it goes live next week. Peterboro have loaned youngster Alfie Potter to Grays for a month. More fall-out from the Rushden game at Salisbury, where midfielder Andy Burgess has been asked by the FA to explain comments attributed to him in a newspaper where he criticised the referee for booking him for dissent. The comments are believed to have been related to the disability of referee Andrew Rodda, who is deaf. Crewe boss Dario Gradi has bemoaned his lack of spending power compared to some of the top Conference sides: "It would be very difficult for us to get players from Stevenage because they are top of the Conference, some of their players will be earning more than ours are." Bury have loaned youngster Dale Stevens to Droylsden for a month, and Ben Leonard to Tamworth for a month. Brentford have loaned striker Ross Montague to Welling for a month. He was recalled from loan at Sutton United yesterday for unknown reasons after scoring three times in seven games. Ex-Bull Chris Weale has extended his Bristol City contract until the end of the season. Looking forward to Saturday's visit of Bradford City to Edgar Street, Hereford United manager Graham Turner says he thinks a super game is in prospect. "Bradford have got big resources and they had a gate of over 13,000 last Saturday for Peterborough's visit (Bradford won 1-0)," Turner told the Worcester News. "We know it will be hard, they're expected to bring over 1,000 supporters here to Edgar Street so it should be a decent game and atmosphere. "Following the victory at Morecambe and confidence being sky high, we can look forward to it and we are in a lovely position at the moment. It's a pleasure looking at the league table." Meanwhile Turner is well aware of the Bulls poor scoring record at home. "That sequence will end shortly. We've had enough chances in the three opening matches to have taken all nine points but we should have won two out of the three. "As long as we continue to make chances, as long as we don't lose our confidence in front of goal, sooner or later it will start going in." Bradford City will travel down tomorrow for an overnight stay prior to their match at Edgar Street on Saturday, according to the Telegraph & Argus. Travel problems blighted their trip to Shrewsbury, a game they lost, but they will make no mistakes in travel arrangements this time with an overnight stop with McCall telling the paper: "A few things cropped up on the day which may have affected us. I don't want to make excuses but our preparation wasn't ideal. Hereford is a bit further on so at least by staying down overnight, we will be prepared correctly. "The boys have trained well this week, though I know it doesn't always go hand-in-hand with how you are going to play, but I had a good feeling before we went to Lincoln and won and I'm quite confident again. You can't give people belief and confidence, that's got to grow with results and the lads are looking good." On the Bulls, McCall acknowledged the poor form at Edgar Street: "It's probably better to be playing them at home at the minute. The further we get into the season, the more we know about teams and players and can give the lads a better idea of their shape and tactics. That's beginning to help us and that's why it was important to see them in the last home game. The stats suggest Hereford don't concede many and we'll have to look at ways to break them down." The paper also reports that McCall attempted to sign Theo Robinson in the summer prior to his Bulls arrival. Cambridge City have won their High Court action to reclaim their stake in their Milton Road home. The club have won the right to remain at the ground until 2010, and will earn 50% of the development value - lost under a deal that was ruled illegal by the Judge. Brentford have recalled Darius Charles and Ross Montague from their loan spells at Sutton United. Ex-Bull Joe Anyinsah has joined Carlisle on loan from Preston. The former Bristol City man is yet to make a first team start for Preston since signing for them from the Robins in the summer of 2005. Mansfield have had the capacity at Field Mill cut again following the latest problems with the ground at the weekend. The club issued more tickets than allowed under their safety certificate, and allowed 200 ticketless fans into the ground as well, for their derby match with Chesterfield. Now the club, already operating on only 70% of the capacity of Field Mill, will see the capacity dropped to only 4,684 until the Safety Advisory Group are happy with arrangements at the club. A spokesman for the SAG said: "We are still investigating what occurred at the recent Chesterfield match, and are working with Mansfield Town to help them build on the safety improvements that have already been made. "We have decided to reduce the capacity of the whole ground to 50% until the club can restore our confidence in the computerised turnstile monitoring system, which is currently unable to accurately determine the number of supporters coming into the ground. The club are also aware of the problems with the turnstile system and share our concerns. Once this problem has been rectified, we will raise the capacity back to 70% in line with ongoing improvement measures." The capacity at Field Mill was cut to 4,684 in the summer, prompting speculation that the club would not meet Football League criteria and be booted out of the League. They gained the increase to 6,557 on the eve of the season but have now lost the extra capacity until further notice. Bury boss Chris Casper is three weeks away from the sack, after failing to record a home win in 2007. The Shakers have now gone 16 games without a win at home since beating Stockport last December, and the club are sitting in the relegation zone. Keith Alexander's appointment as Director of Football in the summer was seen by many as the first nail in Casper's coffin, but Alexander has denied that he is eyeing up the main job. "Everyone is concerned regarding our home form, but the statistics don't lie," said director, Ian Harrop to the Bury Times: "The manager, director of football and board realise that we need to start winning our home games. The performances in two or three of the games have been good, but we haven't held on for the result, and it is a results business. We had a meeting the other night and came out of it feeling very positive. Everyone knows now that our results must improve over the next three or four games." Bury face Dagenham and Accrington in the next two games, with at least one win expected, before a tricky game at home to Alexander's former club Lincoln. In his weekly Hereford Times column Graham Turner has explained how the 46 game League season has been broken down into seven segments. "The first six-match segment is over and of the targets the players set themselves, at least two were reached. From the first six matches, the players felt that 10 points was a realistic target and felt that if we kept three clean sheets then that would be very acceptable. We have picked up 11 points and kept three clean sheets, our goals against column is very good, our goals for fell short of what we expected." Turner is now looking at the next six matches and is inviting the players to set their own targets, both individually and collectively, for those games. In Hereford United's case they can't score at home, in Conlan's case he just can't score. On Saturday, assuming he is picked, Conlan returns to Edgar Street. Bull's coach John Trewick has already commented that with all the chances Hereford have created at home goals are bound to follow. And Bradford striker Barry Conlan is sure goals will come for him and his side. Conlan, a journeyman now with his eleventh club, played against the Bulls last season whilst with Darlington and Mansfield. "I'm long enough in the tooth to know how the game works and I'll get my chance again." He remembers playing at Edgar Street for Mansfield last season as he scored there. "It's a tight little ground but the pitch should be okay. I think we'll get the chance to play our football. "There's a lot of confidence in the team at the moment. The changing room is livening up and all the lads are buzzing." The annual Hereford United Sportsman's Dinner will take place at the Three Counties Hotel On Thursday November 8th. According to the Hereford Times the guest speaker will be Paul Fletcher MBE who is currently chief executive of Coventry City. Fletcher is a former Bolton and Burnley striker. Yeovil's official website has announced prices for the coming Johnstones Paint Trophy match with the Bulls. The website states that Adults will be charged a flat price of £10, with concessions at £5, and Juniors admitted free with a paying Adult for either seating or standing. The match is to be played on October 9th, with a 7.45pm kick off. Bradford will travel to Edgar Street without midfielder Alex Rhodes. A planned reserve run out today has been cancelled after a month on the sidelines. The club are to give a trial to Chilean striker Willy Topp. MK Dons have loaned striker John Hastings to Ebbsfleet for a month. He made his debut last night for his new club. York boss Billy McEwan has refused to quit after his side recorded just one win in the first ten games: "I've given my life to the club for the last two-and-a-half years. It would be easy to walk away, but why would I want someone else to come in and take the credit for this team?" Rushden have fined boss Garry Hill "the maximum possible amount allowed by the football authorities" following his alleged headbutt towards Salisbury man Tommy Widdrington. The FA are still investigating and have charged Hill, and both clubs, over the incident. Grimsby chairman John Fenty has issued a statement defending the club's policy following their poor start to the season, and warns of looming financial problems. The statement starts with a refreshing admission: "The Club's Chairman and Manager have been coming under mounting criticism, which is the fans prerogative and goes with the territory." The open and honest statement continues: "Fans want us to sign players and get wins. It might surprise some but the Board are fans too and want the same. We are trying desperately hard to achieve this, but we need a break, a bit of luck and a few scruffy goals wouldn't go amiss to go with our good performances." Fenty, however, warns that finances at the club are in a dire position: "The Club requires a substantial financial injection within the next two months, in excess of two hundred thousand pounds, to pay its way. So far home attendances have been below budget and if this trend continues, even that amount of money will not be enough to see us through to the end of the season. "We also have approximately three hundred and fifty thousand pounds to find over the next two years to pay off the tax debt baggage from the past." The statement ends with an open plea for fresh blood, and money, in the boardroom: "The Board have never been shy of opening the door to new potential Board members. This has been well publicised. There simply is not a stampede looking to take over the Grimsby Town Football Club or join the Board of Directors. If you are out there and can make a difference, the Club needs you and your support! Contact the Chairman."